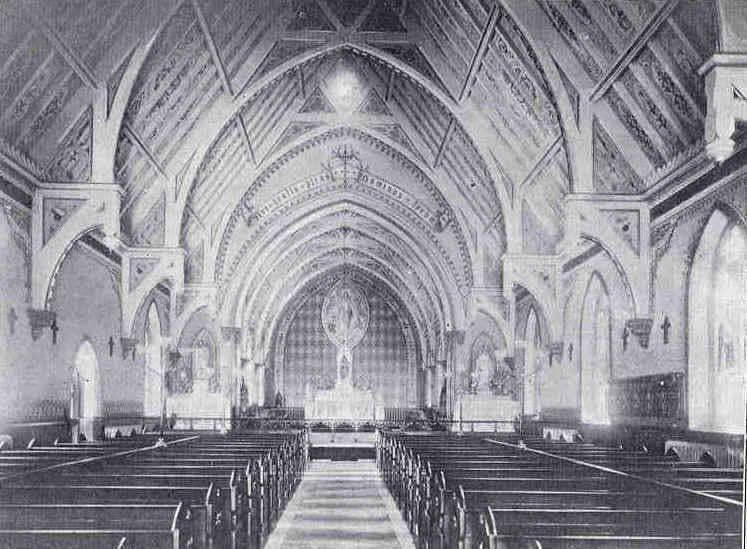 A 1906 newspaper article noted that eight artists were redecorating the Chapel interior. "(T)he artists are painting the ceilings in scroll designs, with a lily and letters "A.M." as a centerpiece. The eight beatitudes will be inscribed in gold between the rafters. The general color scheme is gold and light blue. A large picture of the Immaculate Conception is to be placed above the altar on the south wall of the sanctuary." The letters "A.M." are the abbreviation of the invocation, "Ave Maria," or "Hail Mary." The funds for the improvements and renovations were provided by the Chapel Alumni Association, which donated $3,134, and a $6,000 loan from Father Joseph H. Meehan. Just over $9,000 was expended on these renovations. They took place concurrent with the changes to the structure of the Chapel and the installation of new stained glass in the nave and possibly in the chancel. Fortunately, we have a contemporary photograph. This wide view shows the ceiling rather well. Together with the arches, it is rather light in color and decorated, as described above, with floral motifs throughout. In the late 1990s when the chancel arch was undergoing repairs, the bright lights showed the shadows of this decoration under later painting. Extensive decorative stenciling surrounds the windows and the upper portion of the walls. Above the chancel arch, an ornate banner has been painted with the same words as we find in the 1895 photograph. It reads "Ave Gratia Plena, Dominus Tecum" (Hail, Full of Grace, the Lord is with Thee). These are the words spoken to Mary at the Annunciation. This leads us to the chancel wall. The centerpiece is a painting of the Immaculate Conception, placed in a "mandorla." A mandorla is a panel in the shape of an almond. In medieval art, it was reserved for figures of Christ and the Blessed Virgin and major saints. Its shape fits very well as it echoes the gothic lines of the Chapel. The altars have been painted white and a mandorla also has been used as a decorative background highlighting the statues of the Blessed Virgin and St. Joseph on the side altars. The Stations of the Cross are simple crosses. New lighting, more evident in the photograph below, has been installed. The sanctuary and side altars are much clearer in this photograph. The decoration is essentially the same. 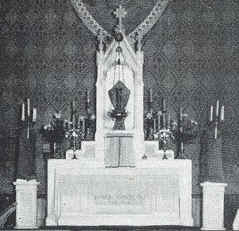 This photograph reveals the new main altar. This new marble altar was donated by Monsignor Isaac P. Whelan, Rector of St. Patrick's Pro-Cathedral from 1905 to 1918. It was not a part of the 1906 renovations and was installed in 1915. The Board of Trustees minutes record a vote of thanks to Monsignor Whelan for his gift of $2,000 for the purchase of this altar. 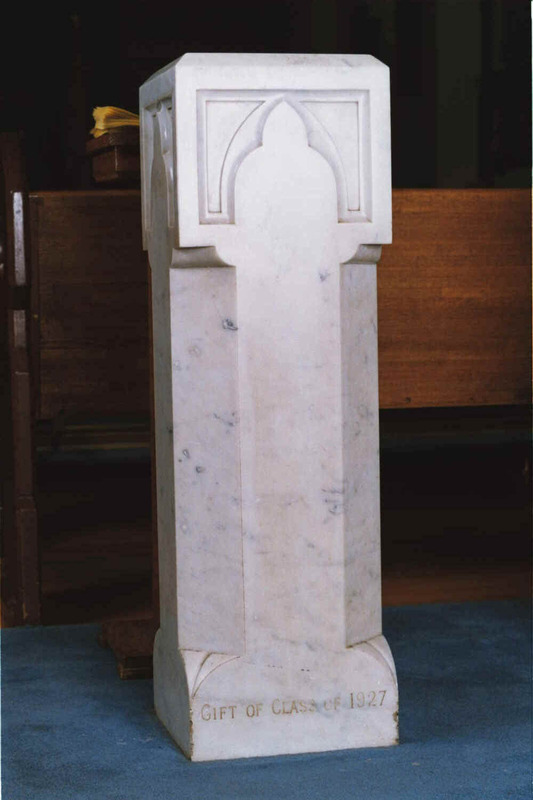 The new altar is constructed of white marble. 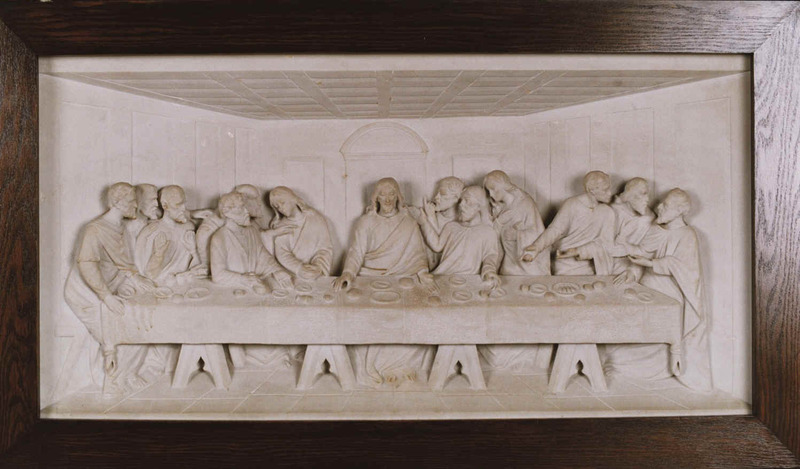 In the center of the base is a carved marble representation of daVinci's Last Supper. Three levels of gradines frame the tabernacle, which is surmounted by an ornate gothic tower containing the crucifix. On either side, and separate from the altar are two marble pedestals surmounted by angels holding candelabra. The two wooden side altars, painted white in the earlier renovation, remain. The polychrome statues of the Blessed Virgin and St. Joseph remain. Several details emerge quite clearly in this photograph. The Tabernacle and the gothic tower above it are very clear. The Last Supper on the altar is more evident. The chancel wall is bordered with a decorative band containing lettering. The main portion of the wall is monochrome with stenciled details throughout. A careful examination reveals details of the original painting of the Immaculate Conception. In the lower part, we see angels kneeling at the feet of the Blessed Virgin. The renovation of the 1930s would eliminate these angels. We also can see the sanctuary lamp hanging in the center of the sanctuary. 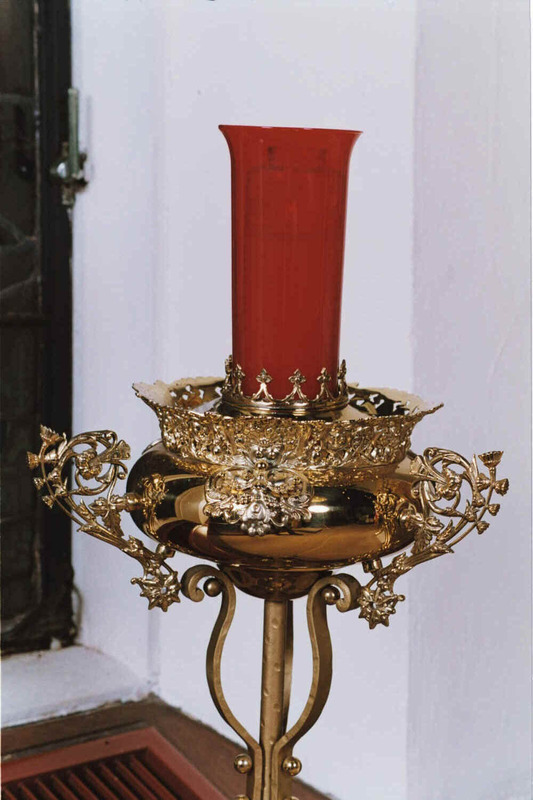 It is possible that this lamp is part of the original furnishings of the Chapel but may have been added as part of the renovations in the early 1900s. 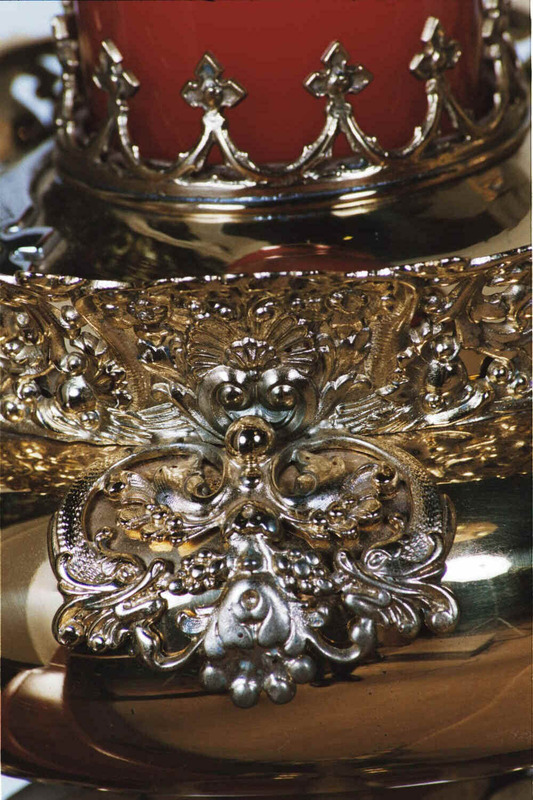 The lamp is a reminder of the Eucharistic presence in the tabernacle. Until recently it was common for these candles to be suspended from the ceiling. This lamp has been refurbished and placed on a wrought iron stand. "This (plaque) is put here, (the object as an expression of) very great gratitude, then and now. Oct. 1907"
The donor and the reason for his gratitude remain unknown. 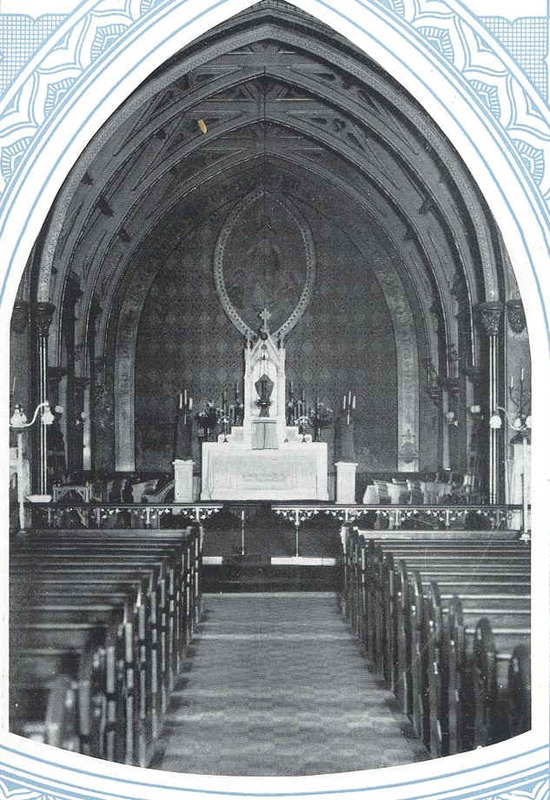 In 1927, new marble holy water fonts were placed on either side of the aisles at the entrance of the Chapel. They were a gift of the Class of 1927. The fonts were imported from Europe by Seiz Brothers, a church goods firm in New York City. In 1928, a new Austin Two Manual organ with seven ranks was installed. 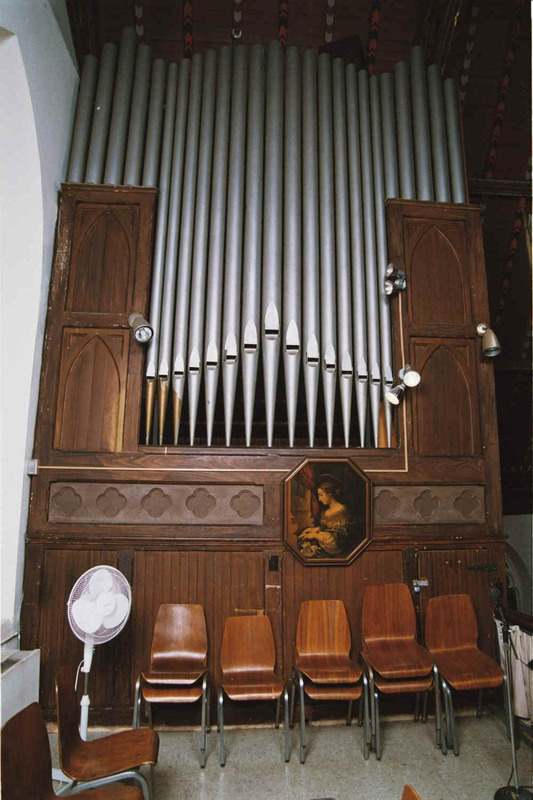 Its pipes remain but it has been replaced by an electronic organ. "Gift of the Class of 1927"